● metal knob cap, the cellular machine feet. ● the use of gold-plated RCA signal input lotus seat. ● Adopt with oxidation amber gold-plated output terminal. ● red cherry wood side of the decorative sheet, elegant and dignified. ● Blue LED power indicator. 12AT7: the burning world "quite famous air excellent sense of wideband, low noise, u tube. Power cattle output cattle imported audio-specific silicon silicon steel layer and section wound around technology. Cow power silicon steel: 114mm * 60mm output silicon steel: 96mm * 40mm. High-quality nylon frame, high-purity oxygen-free copper wire. ● Taiwan production W.L Wizard potentiometer volume control. ● input within the machine using Teflon silver plated shielded signal lines, strong anti-interference, transmission failure decreased. ● German WIMA red MKP polypropylene coupling. ● PCB model using sets of domestic production and some carbon film resistors; scaffolding welding models feature military Dahongpao metal film resistors, carbon film mix. ● high-voltage secondary rectifier, 5Z3P * 2 gall rectifier, four imported large pond and two inductor filter. 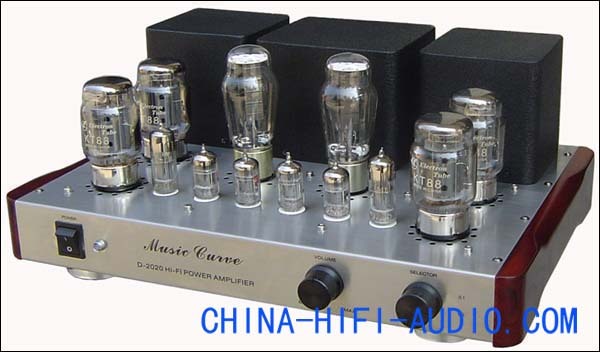 ● reference to the improvement of the classic lines, famous 12AT7 * 2 voltage amplification, 12AU7 * 2 phase inversion, 6N6 * 2 cathode output driven, push-pull class AB amplification. A wider frequency response, phase shift to smaller, higher fidelity. ● Transformer with epoxy potting, solid and reliable, high temperature, insulation, moisture, shock absorption and play a role, can greatly reduce the magnetic coupling through the chassis to reduce resonance, and reduce noise.